New purchase, 1989 FJ1200. General advice! FJowners.com > General Category > Introductions > New purchase, 1989 FJ1200. General advice! Finally found a bike that I'm super proud of, and lucky to own. 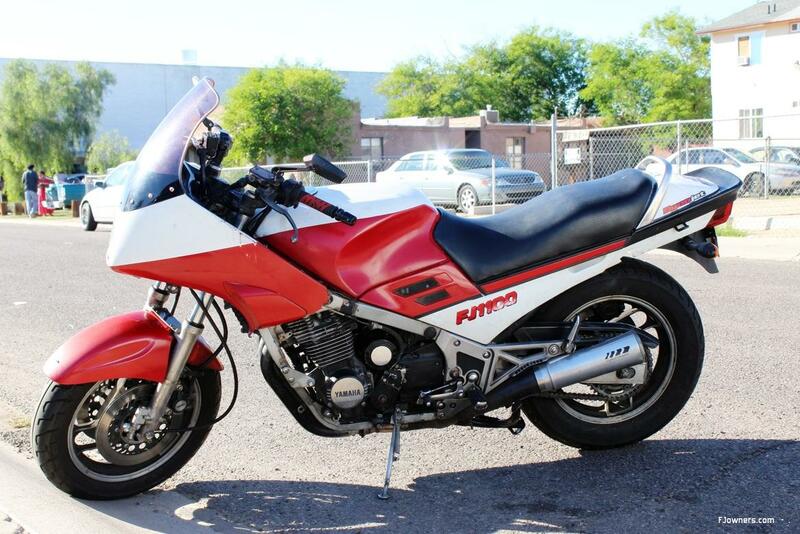 I picked up a 1989 FJ1200, in great condition, and well maintained. At the moment it needs a new set of fork seals, and a new rear tire. I was hoping for some advice on a wide range of topics, apologies if they are already well covered in this forum! Wow, how can I tone this vibration down?! Not only for my own comfort, but for the old plastic's sake as well. And everything else it shakes. It's not awful, the carbs could use some syncing to smooth it out. I'd love to go to a 17 inch rear wheel, but I don't have any desire to modify the swing arm to accommodate this. What is the easiest way to get to a 17inch rear wheel? Will I even notice much of a difference, or is it simply a matter or wider selection of tires? I have no plans of tracking this bike, ever. Still, I would like some suspension that communicates more. How can I get that without replacing the front suspension entirely? Not opposed to replacing the rear shock. This bike is in great condition, that said, what old OEM parts (hoses, boots, etc.) should definitely be inspected or replaced? Braided hoses are apparently the way to go for hydraulics and fuel...? Re: New purchase, 1989 FJ1200. General advice! With any "new" FJ purchase I always recommend a through maintenance procedure. You just don't know what the previous owners did or did not do....so do it yourself...besides, doing it you will get to know your FJ. Check the valve shim clearances (stone cold engine) and adjust your valves as needed. Pop in some fresh plugs. Then see how the engine runs. You may need some carb cleaning, you may not. Do a warm compression check to see how healthy the engine is. Do this after the valve adjustment, not before. Now check the chassis and brakes. Remove clean and grease the swing arm linkage and pivot shaft bearings. Remove the forks and grease the steering head bearings, replace the fork fluid. Check the thickness of the brake pads. Replace the oem rubber brake lines with ss lines, clean out the reservoirs and use fresh brake fluid. Now...once everything is up to snuff, do the modifications. We have many files on FJ modifications. No need to modify your swing arm to run a 17" rear wheel. The rear shock is the first thing I recommend replaced. RPM / Penske / Hagon are popular shock replacements. Next..Get rid of those weak sauce oem fork springs. RPM has a great fork valve and spring combo you should consider. For better searching within the site use google and type fjowners.com search subject like fjowners.com rear shock mod. There might be better ways of doing it but I usually find what I need doing this. Rear shock - plenty of options RPM top of the line plug and play to more budget concious Hagons. You can just google 1989 FJ1200 rear shock and there's a lot of options out there depending on your budget. With any luck you might find an aftermarket shock at a wreckers that could be suitable. I got a Hagon from an FJ1200 that was being parted out on EBay. Chuck both tires. There are still a few good options for the 16" rear. I have Avon Storm 3D X-M 's F&R. There is a 17" rear wheel swap with a GSXR one that is fairly simple. Plenty of info on the site here for that. This link gives some more information on the same wheel mod along with the years and models that will work. Also the 1994-1997 Suzuki RF900 rear wheel is the exact same part number as the 1998 GSX-R1100 rear wheel and will work just as well. Thank you for all the advice! So far I've installed a set of Shinko 011 "Verge" radial tires. An excellent tire with great grip; I'm happy with them! I also had the fork seals/oil replaced, and overall the suspension got a clean bill of health. This is still on the agenda, though: Remove clean and grease the swing arm linkage and pivot shaft bearings. Also, I've noticed an odd problem with restarting the bike. Occasionally the starter acts like it is incapable of turning the motor over when I go to restart it soon after a shutdown. It sounds like it is struggling to turn at all. Turning the ignition off, then back on, and hitting the starter again always works. Am I observing this issue? "Another problem is on pressing the starter button the motor doesn’t turn over and all you hear is a noise from within the engine. This is the starter clutch letting slip and not engaging the drive to the crank (made worse on very cold morning start ups due to the extra friction). The fault can occur if you have used fully synthetic engine oil (FJ is designed to run on base oil) or the rollers have worn within the starter clutch. The only answer is replacing the unit, not easy as it’s on top of the gearbox so requires the splitting of the crankcases." I am using sem-synthetic oil, 20w-50, so a full synthetic oil is not the cause of this. The bike also only has 29k miles on it, surely the rollers on the clutch haven't worn out? Any idea what's going on here? Crack the throttle open a little as you crank it. I wouldnt worry too much about this, the bike just doesnt like hot lapping. Mine doesnt either, but its never caused any issues. Front end - get the RPM bushing/seal kit for starters - then the fork valve/spring combo. That will keep your standard front end with greatly improved feel. Solved. Just a little crack and it seems to allow a hot restart with no issue. I loathe winging a motor way out just to get it started. Another random question; Is the instrument cluster supposed to be floating? I.e If I push on the lower area of it, I can tilt it somewhat. It also moves during suspension travel. It behaves as if it's mounted on some kind of dampening setup? Is this normal? Yep, it's normal. The gauge cluster should not wiggle while riding, it should be steady. At each end, the cluster has a sleeved rubber bushing secured by a bolt to the fairing for vibration isolation. It wiggles while riding. What can I do to address this? You gotta pull the fairing off to get to those bolts. Try gently tightening the bolts first, see if that helps...if not, go ahead and order and install 2 new dampers. While you have the gauge cluster out, you might as well replace the light bulbs....get some fresh ones in there. Aren't 30 year old bikes fun? On second thought, trying to get those old rubber dampers out or new ones in...you might crack the 30 year old plastic ears on the gauge body. Try adding thin rubber washers under the steel washers, then re tightening the bolts.